They say good fences make good neighbours, but we prefer to say good fences make good yards. An attractive, well-built fence can heighten your enjoyment of your property, whether it’s there to keep your kids and pets nearby, add a little privacy, or just boost your curb appeal. If you’re interested in building a fence, don’t make a move before you check with your city or town. They’ll tell you about any height or material restrictions for your area, and help you secure a permit (if required). If you belong to a Homeowner’s Association, ask about any guidelines they may have in place. Often, the nicer side of the fence — the side that doesn’t show the posts and rails — needs to face the street. There’s nothing worse than finishing a project only to find out you have to tear it down! If you’re not limited to a certain style, look around at different types of fencing and decide what suits your property. Maybe a shadowbox fence stained to match your back deck? Or a concave fence that dips down to show off the view of the woods behind your house? Or do you need a six-foot privacy fence to block the view of your sweaty neighbour BBQing without his shirt on? If you and your next-door neighbours both agree you’d like to put up a fence, you can often split the cost to make it easier on everyone’s budget. But they’re not obligated to pay for half, so it’s best to bring it up lightly to gauge their interest in a new fence. When it comes to choosing your materials, wood is a classic choice — but not every type of wood makes a long-lasting fence. 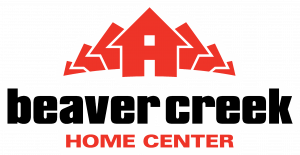 The team at your local Beaver Creek Home Center can help you choose the best variety, and explain how to treat it. If you’re not up for the maintenance of a wooden fence, consider vinyl, aluminum, steel, or wrought iron. Some homeowners like to build a “prettier” fence in the front of their home — like a classic whitewashed picket fence — and put up an inexpensive chain link fence in the backyard where it’s less visible from the street. When you’re ready to buy your materials, take along a detailed sketch of the property showing exactly where the fence will go. Remember that any fenced area should have two exits, for safety reasons. Make sure you know exactly where your property line is, so you can keep the fence on your own turf. Place your stakes at the corners first, and then square the corners and move on to staking the middle posts. Get ready to start digging! In Canada, fence posts need to be anchored below the frost line to make sure the fence is steady. Each post needs to be buried at least 33 per cent as deep as it is tall — with some room around it on all sides — and there needs to be 3-4 inches of gravel at the bottom of the hole. Once the post is nice and straight, you’ll use instant concrete to set it in place. Once the concrete has hardened, cover the hole with dirt. After you install a builder’s line — the horizontal line from post to post that helps you keep a consistent height — and the support boards, you get to start the satisfying process of adding the pickets. Seeing those boards go up, one by one, makes you feel like you’re really building something spectacular. Once the fence is up, don’t forget to beautify the wood — and protect it from the elements — with some water seal, stain, or paint.